Foodie (Photo) Friday! I made a lot! Especially from the cookbook Isa Does It! This week was a big week for my cooking. Not only did I create my own original recipe for a favorite, typically very non vegan appetizer, but I also tested tons of other people’s recipes. The most impressive recipe I have tried so far was definitely the Sweet Potato Gnocchi with Tarragon Cashew Cream and Brussels Sprouts. I have made my own gnocchi from recipes before, but it seemed so difficult and was such a long process. Maybe my cooking skills have drastically improved over time and I just do things faster and in a more organized time saving manner, but I still think this recipe is by far an easier and simple way of making you own vegan gnocchi from scratch than the previous recipe I tried. It only really takes awhile because you have to bake the sweet potato (or potatoes…but I found a 1 lb sweet potato that worked out very well). The sauce is also simplistic yet has a very fancy flavor/touch to it with the tarragon. And a cashew based sauce makes almost any pasta recipe rich and luxurious. 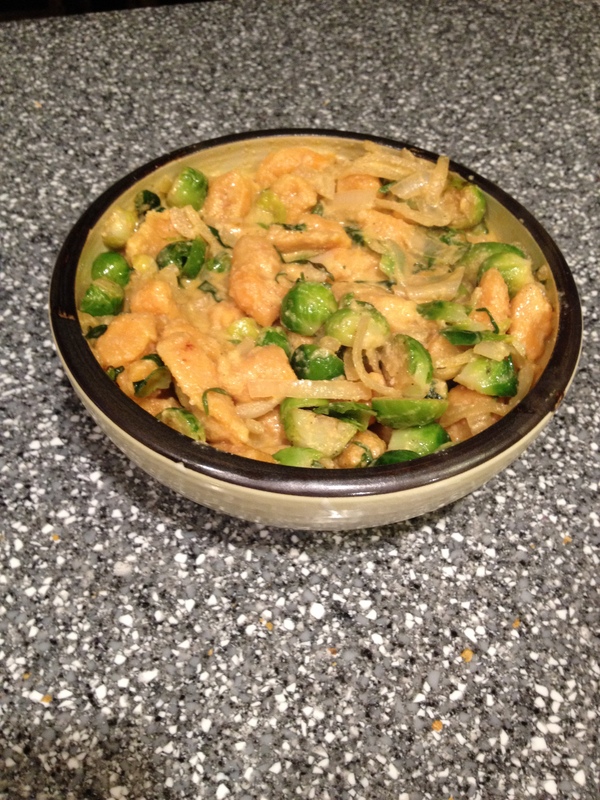 The Brussels Sprouts were the perfect finishing touch, and add to the dish to make it a complete healthful meal. I love the bowls so far in this cookbook. I think I forgot to post about the cucumber ranch tofu bowl I made New Year’s Eve? Well that was pretty good. Even better was the pizza bowl, though. I used tofurky italian sausages (Which, to my delight, do not contain soy protein isolate in them which I am really trying to avoid as much as possible now. My nutritionist said she believes that it is that form of soy that causes the most problems for our hormone balance, and it is very highly processed (and typically g.m.o I think?) so it is good to avoid or eat irregularly. Tofu is fine unless you have digestive/other sensitivities to it, whIch I do not. Anyways, this was absolutely delicious and comforting. The sauce is really, really good. It reminds me of pink (or vodka cream) sauce, which was one of my favorite sauces before I went vegan and I have found difficult to replicate as a vegan despite trying . Actually now this gives me an idea to try and make an even more authentic version of it! Yay! Paired with the kale (which I actually seemed to cook right for the first time ever…I typically only eat it raw), rice, sausage, garlic, red onions, olives, etc it is just so wonderfully filling and tasty! My pictures of it are not the prettiest, but believe me, it is so yummy! 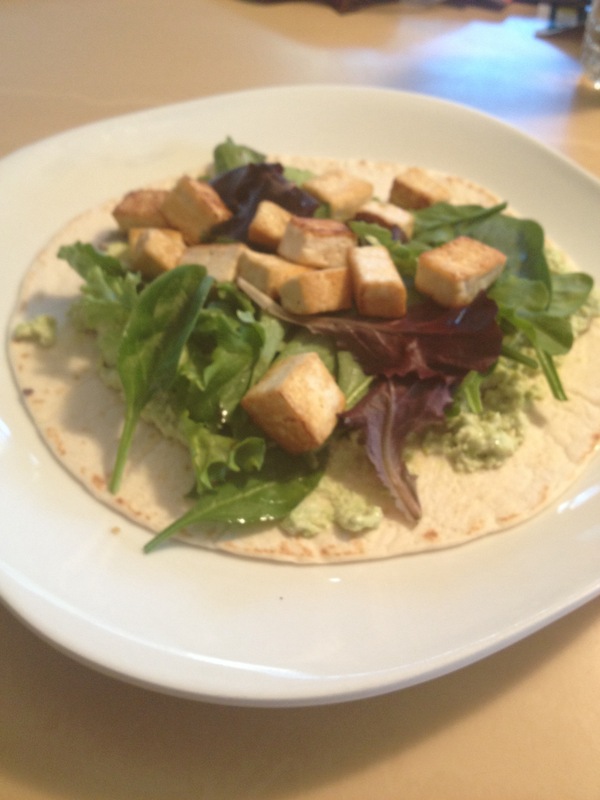 I also made the tofu wraps with edamame hummus. It somehow tastes kind of like a Japanese-inspired egg salad wrap to me which I thought was pretty cool. 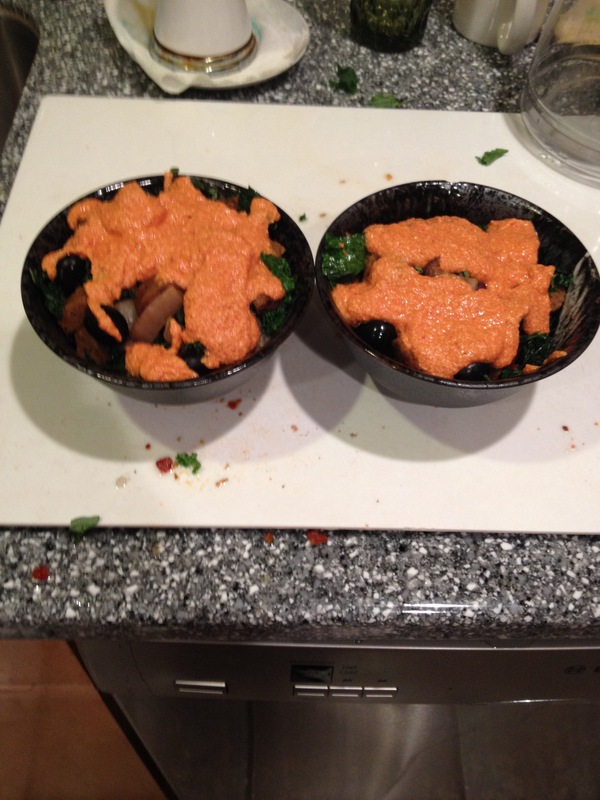 I will definitely be making the edamame based (instead of chickpea) hummus on it’s own again multiple times. The tofu was really good too though! I love anything with sesame oil in it, and it crisps the tofu perfectly. Isa Chandra Moscowitz doesa really good job through writing her recipes teaching people the proper methods of cooking her dishes without having them fail horribly. Hopefully I can get there myself too! I did not use sprouts because when I buy them they seem to go bad too fast, instead I used greens. When I use up the leftovers tomorrow though, I am probably going to use baby arugula. Yum! Aside from cooking from Isa Does It, I found this recipe on a facebook group I belong to and was intrigued so I gave it a try. 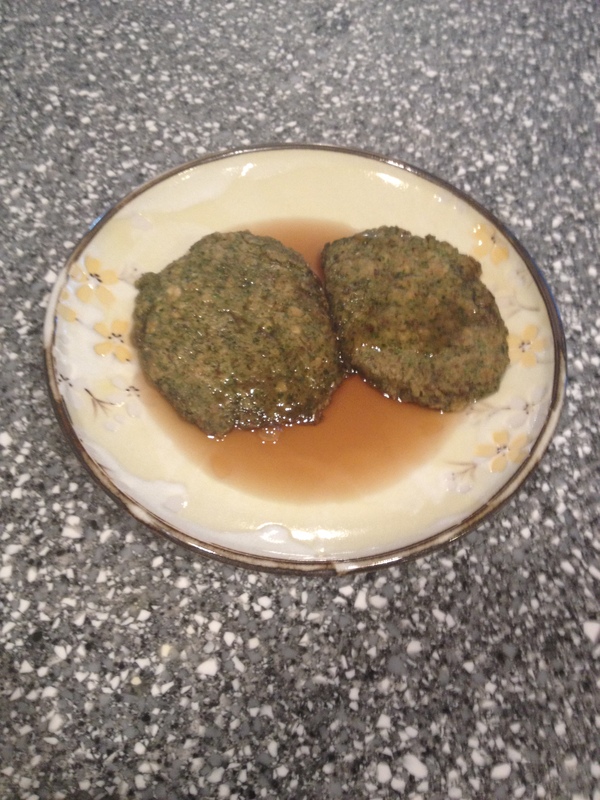 Behold, Green Pancakes! not the prettiest again but behold green pancakes! They look kinda gross, but I felt really good about eating them for my breakfast and do not taste too different from unhealthy versions of pancakes…especially when you add some maple syrup, ha, ha. I kept thinking of Dr. Seuss’ Green Eggs and Ham and thinking this would make a good vegan story like that, especially for kids while eating these. So it was fun, healthy, and fed my belly all at once. Finally, I made a really delicious salad today. 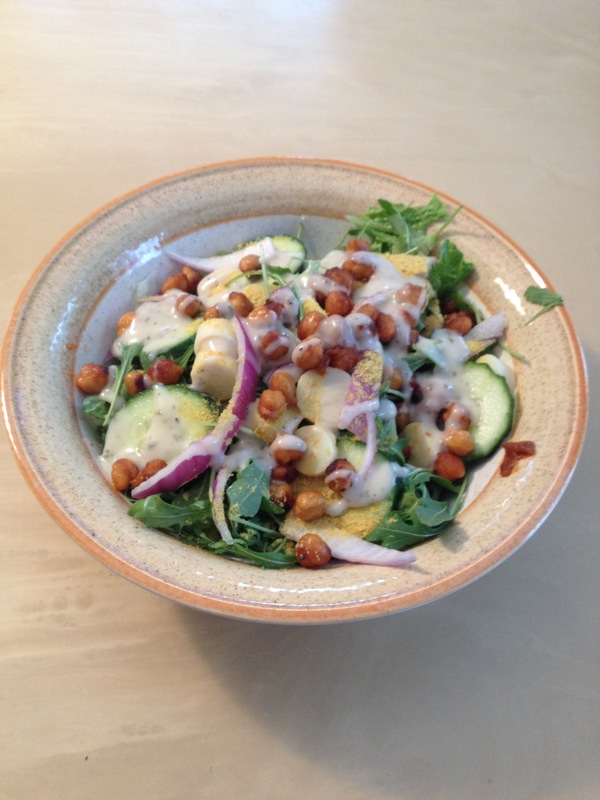 The centerpiece of the salad was the Chickpea Bacon recipe from Vegan Sandwiches Save the Day! Gosh do I love that book! Ta da! And now you know what I cooked up this week! PS: If you haven’t yet, you can follow me on these social media outlets where I post related (and unrelated) things to my blog. And I think that’s everything for now! I will be adding these to the end of my blog every so often for new people to click on and explore. Also, I love comments and feedback and love it when people spread and share my work I am doing here, so do not be shy about that!